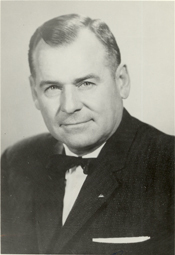 BEERMANN, Ralph Frederick, a Representative from Nebraska; born near Dakota City, Dakota County, Nebr., August 13, 1912; attended public schools, South Sioux City, Nebr. ; Morningside College, Sioux City, Iowa, and Army specialist schools; during the Second World War served in the United States Army for three years in African-European Theaters in the Six Hundred and First Ordnance Battalion, Three Hundred and First Ordnance Regiment; engaged in partnership with six brothers (Beermann Bros.) in farming, cattle feeding, and alfalfa dehydrating in Dakota County, Nebr. ; chairman of Dakota County Republican Central Committee for ten years; organized Dakota County Young Republicans; elected as a Republican to the Eighty-seventh and to the Eighty-eighth Congresses (January 3, 1961-January 3, 1965); unsuccessful candidate in 1964 for reelection to the Eighty-ninth Congress; resumed business pursuits; died in an airplane crash at Sioux City Municipal Airport, Iowa, February 17, 1977; interment in Dakota City Cemetery, Dakota City, Nebr.